Background: Atherosclerosis is a very common disease in which fat deposition in the inner layers of arteries leading to plaques formation. Dapagliflozin is one of a new class of drugs known as the sodium-glucose cotransporter-2 inhibitors, responsible for lowering of the blood glucose level, and enhancing urinary glucose excretion. Dapagliflozin may lower blood glucose levels and at the same time prevent cardiovascular diseases. Objective: The objective of this study was to assess the effect of dapagliflozin on atherosclerosis through interfering with inflammatory and oxidative pathways. 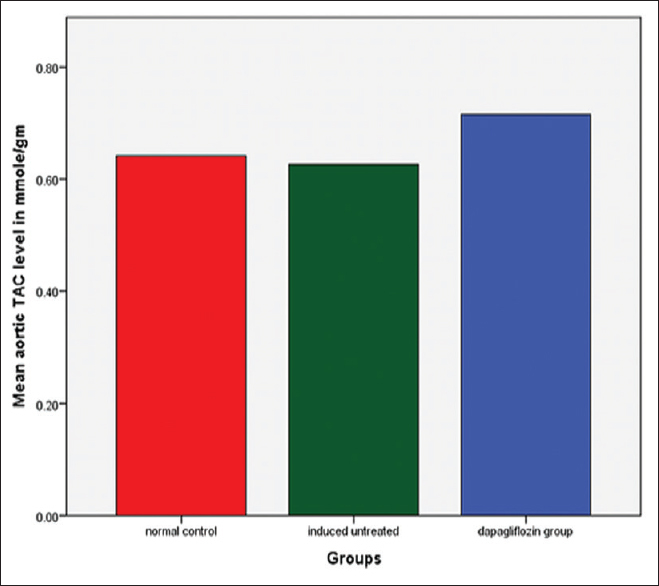 Materials and Methods: Eighteen local domestic male rabbits were used in this study. The rabbits were randomly divided into three groups: Group I rabbits fed normal chow diet for 12 weeks; Group II rabbits fed with 0.5% cholesterol-enriched diet; and Group III rabbits fed with 0.5% cholesterol-enriched diet together with dapagliflozin (1 mg/kg once daily). Blood samples were collected before the study (zero time) and every 4 weeks for the measurement of serum total cholesterol, triglycerides (TGs), high-density lipoprotein cholesterol (HDL-C), low-density lipoprotein cholesterol (LDL-C), very LDL-C (VLDL-C), tumor necrosis factor alpha (TNF-α), and endothelin-1 (ET-1). Results: Dapagliflozin treatment showed insignificant elevation in total cholesterol and LDL-C, significant decrease VLDL-C and TG, and significant elevation of HDL-C level (P < 0.05) compared with the induced untreated group. It was insignificantly decreased inflammatory markers (TNF-α and ET-1), increased aortic total antioxidant capacity, and significantly reduced aortic intima thickness compared with induced untreated group. Dapagliflozin, by slightly interfering with inflammatory and oxidative pathways, may show beneficial effects on atherosclerosis and can attenuate the atherosclerotic lesion formation. Conclusion: Dapagliflozin may have a beneficial effect on atherosclerosis by slightly interfering with inflammatory and oxidative pathways and can reduce the atherosclerotic lesion formation; however, our study needs further clinical studies to be carried out on large population. Atherosclerosis is a very common disease in which fat deposition in the inner layers of arteries leading to plaques formation. The exact risk factors of atherosclerosis are unknown, of which main risk factors include hypertension, diabetes mellitus (DM), obesity which can be modified, and atherosclerosis can be delayed or prevented, while age, genetics, and male gender are nonmodifiable. Inflammation has been considered to play an important role in the initiation and development of atherosclerosis. For this reason, numerous inflammatory markers have been investigated as candidates for the enhancement of cardiovascular risk assessment. 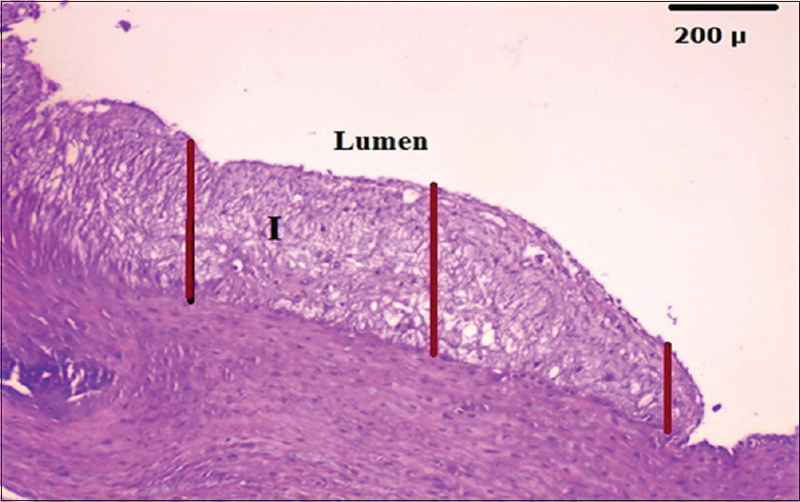 Tumor necrosis factor alpha (TNF-α) considered the most important inflammatory marker that maintains low-level systemic inflammation. Several mechanisms were mentioned to interpret the proatherogenic effects of TNF-α on the endothelium, including its action in reactive oxygen species (ROS) formation, reduction of the bioavailability of nitric oxide, and increasing the permeability of endothelium to circulating blood components and cells. Endothelin-1 (ET-1) is a peptide responsible for pathophysiological changes associated with microvascular and macrovascular disease. ET-1 may lead to atherosclerosis by its action as a mitogen on smooth muscle cells of vessels and activation of vascular inflammation and cytokine release in atherosclerotic lesions. ET-1 levels of coronary artery and plasma are high in early and late atherosclerosis in humans. Oxidative stress contributes to atherosclerosis. Antioxidant is any substance that prevents or removes oxidative damage and inhibits the process of oxidation to a target molecule. The total antioxidant capacity (TAC) is a mirror of the activity of the antioxidant system. Dapagliflozin is one of a new class of drugs known as the sodium-glucose cotransporter-2 inhibitors, responsible for lowering of the blood glucose level by inhibiting renal glucose and sodium reabsorption and enhancing urinary glucose excretion. Epidemiological studies have indicated that cardiovascular diseases (CVDs) become the most common complications and the major leading cause of morbidity and mortality for DM patients. Dapagliflozin may lower blood glucose levels, and at the same time, prevent CVDs. Eighteen local domestic male rabbits were used in this study. The rabbits were randomly distributed into three groups each group consisted of six rabbits include the following: Group I rabbits fed normal chow diet (at libitum) for 12 weeks; Group II rabbits fed with atherogenic diet containing 0.5% cholesterol for 12 weeks; and Group III rabbits fed atherogenic diet (0.5% cholesterol) with dapagliflozin (1 mg/kg once daily) for 12 weeks. The blood samples were collected at zero time and every 4 weeks on atherogenic diets for the measurement of serum level of total cholesterol triglycerides (TGs), high-density lipoprotein cholesterol (HDL-C), low-density lipoprotein cholesterol (LDL-C), very LDL-C (VLDL-C), TNF-α, and ET-1. At the end of the study (after 12 weeks), the aorta was removed for the measurement of TAC level and aortic intima thickness. There was a statistically insignificant difference (P > 0.05) in body weight levels between the control group and the other groups on atherogenic diet suggesting that cholesterol and dapagliflozin had no effect on body weight. Compared with the control group, levels of total cholesterol, TGs, HDL-C, LDL-C, VLDL-C, TNF-α, ET-1, and aortic intima thickness were significantly increased whereas aortic TAC insignificantly decreased (P > 0.05). Dapagliflozin treatment showed an insignificant increase in total cholesterol and LDL-C while significantly decreased TG and VLDL-C and significantly increased HDL-C level compared with the induced group (P < 0.05). Dapagliflozin insignificantly decreased the elevation in TNF-α, ET-1, significantly decreased aortic intima thickness (P < 0.05), and insignificantly increased the aortic TAC level compared with the induced group as shown in [Table 1], [Table 2], [Table 3]. 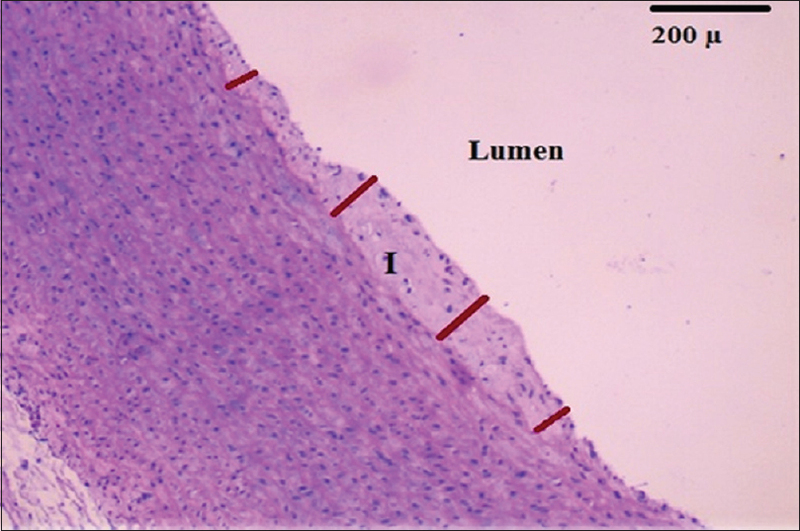 The results of the present study indicated that 12 weeks' consumption of atherogenic diet with 0.5% cholesterol increased the serum lipid profile and activated atherosclerosis lesions formation involving the intimal thickening. 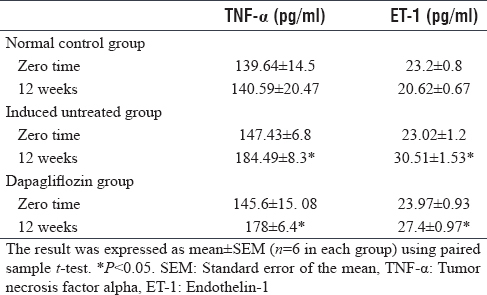 In addition, the results of the present study revealed that the level of serum TNF-α and ET-1 was significantly elevated in the atherosclerotic rabbits (induced untreated group) and dapagliflozin treatment could insignificantly lower them. 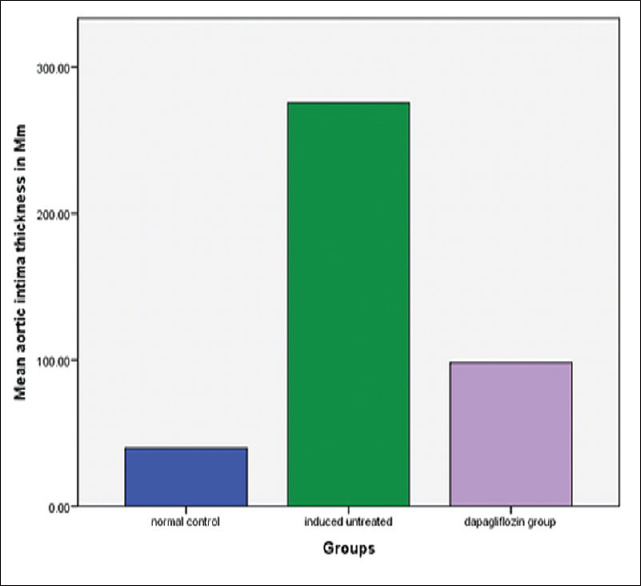 The present study revealed that treatment with dapagliflozin showed different effects on the serum lipid profile involve insignificant increase in total cholesterol and LDL-C level, significant decrease in TG and VLDL-C, and significant increase in HDL-C level compared with the induced untreated group as shown in [Figure 1]. Leng et al. also found that dapagliflozin treatment for 12 weeks significantly lowered TG level in ApoE−/− mice. Dapagliflozin decreases TG concentration and increases HDL-C was also showed by Min et al. Matthaei et al. reported elevation in the total cholesterol level from baseline in patients receiving dapagliflozin treatment. The result of the present study found that dapagliflozin insignificantly decreased inflammatory markers (TNF-α and ET-1) compared to the induced untreated hypercholesterolemic rabbit as shown in [Figure 2]. Sato et al. found that dapagliflozin significantly decreased serum TNF-α level in diabetic patients with coronary artery disease when treated with dapagliflozin for 6 months but no data showed the effect of dapagliflozin on serum TNF-α level in rabbits. The differences in results may be due to the fact that the drug was used for humans and not for rabbits and this study was longer than our study, and no data had revealed the effect of dapagliflozin on serum ET-1 level. Gaspari et al. also found that chronic dapagliflozin treatment for 4 weeks in ApoE−/− adult mice lowered molecular changes and endothelial cell dysfunction associated with early atherogenesis. Endothelial cell dysfunction is a main contributor to early atherogenesis in type 2 diabetic patient. Adhesion molecule upregulation leads to endothelial cell dysfunction and considered to be a precursor of atherosclerosis occurrence. Reduction of endothelial dysfunction and macrophage infiltration and upregulation of intercellular cell adhesion molecule-1 expression, in ApoE−/− mice could give a mechanism of dapagliflozin in modulating the beginning and progression of atherogenesis. This study revealed that dapagliflozin treatment insignificantly increased TAC level in aortic tissue of atherosclerotic hypercholesterolemic rabbit compared with the induced untreated group as shown in [Figure 3]. Abdel-Wahab et al. showed that the serum TAC level was significantly elevated in diabetic Wistar rats treated with dapagliflozin for 12 weeks; however, the differences in results may be due to the fact that rats were used as animal models instead of rabbits and the serum was used instead of aorta for the measurement of TAC level, also Leng et al. study on atherosclerotic ApoE−/− mice found that dapagliflozin reduced the aortic production of ROS. Diabetes-accelerated atherosclerosis is usually associated with an increased level of interleukin (IL)-18 and IL-1β by the activation of NLRP3 inflammation involving the formation of ROS. The treatment with dapagliflozin may inhibit ROS-NLRP3 pathway by lowering the blood sugar and lipid and inhibit IL-1β and IL-18 production and reduced the accelerated progression of atherosclerosis in the aortic tissue. 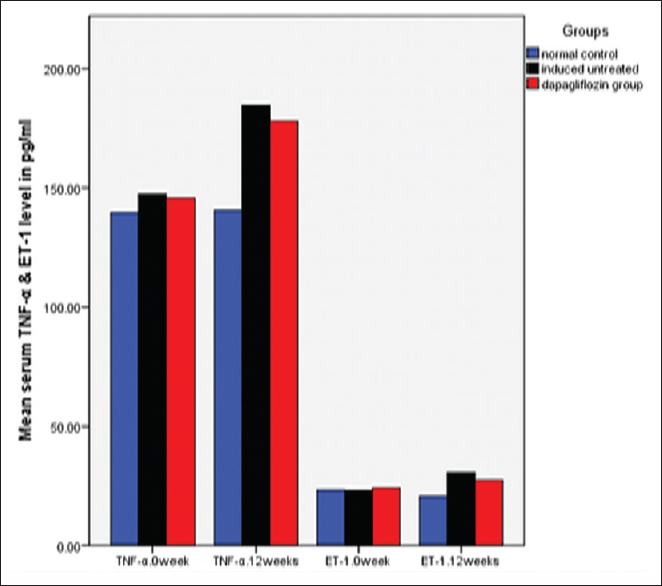 In the present study, dapagliflozin showed a significant decrease in aortic intima thickness compared with the induced untreated group as shown in [Figure 4], [Figure 5], [Figure 6]. There was no data available about the effect of dapagliflozin on the aortic intima thickness in atherosclerotic rabbits; however, Leng et al. found that dapagliflozin retarded the onset and the development of aortic lesions in ApoE−/− mice with diabetes, indicated that dapagliflozin might be interfere with the formation of diabetic atherosclerosis. The main mechanisms that are responsible for the dapagliflozin benefits in atherosclerosis may be the inhibition of inflammatory response during the pathogenesis of atherosclerosis which in turn suppress the infiltration of macrophage into the lesions suggesting its benefit for lesion stability. The results of this study indicate that dapagliflozin may have a beneficial effect on atherosclerosis by slightly interfering with inflammatory and oxidative pathways and can reduce the atherosclerotic lesion formation; however, our study needs further clinical studies to be carried out on large population. Tavafi M. Complexity of diabetic nephropathy pathogenesis and design of investigations. J Renal Inj Prev 2013;2:59-62. Keche AS, Tirpude BH, Bobade HJ. 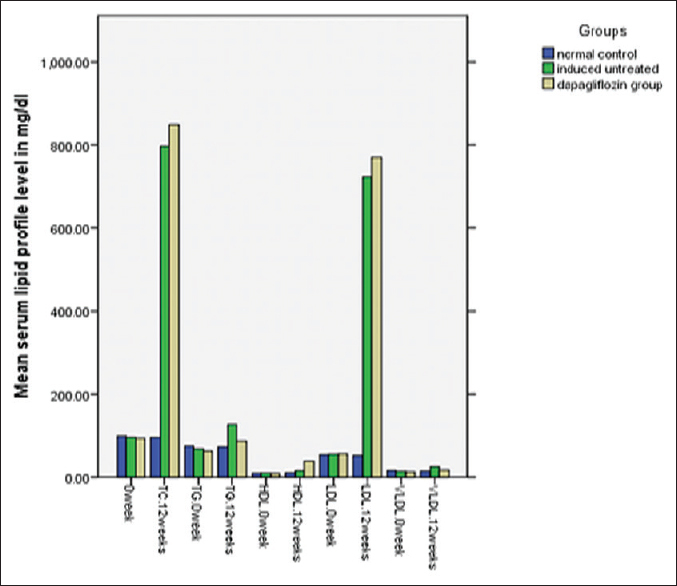 Correlation of risk factors with coronary atherosclerosis. J Indian Acad Forensic Med 2012;34:2. Momiyama Y, Adachi H, Fairweather D, Ishizaka N, Saita E. Inflammation, atherosclerosis and coronary artery disease. Clin Med Insights Cardiol 2014;8:67-70. Urschel K, Cicha I. TNF-α in the cardiovascular system: From physiology to therapy. Int J Interferon Cytokine Mediat Res 2015;7:9-25. Jankowich MD, Wu WC, Choudhary G. Association of elevated plasma endothelin-1 levels with pulmonary hypertension, mortality, and heart failure in African American individuals: The Jackson heart study. JAMA Cardiol 2016;1:461-9. Li MW, Mian MO, Barhoumi T, Rehman A, Mann K, Paradis P, et al. Endothelin-1 overexpression exacerbates atherosclerosis and induces aortic aneurysms in apolipoprotein E knockout mice. Arterioscler Thromb Vasc Biol 2013;33:2306-15. Wagner KH, Brath H. A global view on the development of non-communicable diseases. Prev Med 2012;54 Suppl: S38-41. Rajesh NK, Satish Y, Mundal S. Antioxidant-a review. J Chem Pharm Res 2009;1:102-4. Sotoudeh Anvari M, Mortazavian Babaki M, Boroumand MA, Eslami B, Jalali A, Goodarzynejad H, et al. Relationship between calculated total antioxidant status and atherosclerotic coronary artery disease. Anatol J Cardiol 2016;16:689-95. Kalra S. Sodium glucose co-transporter-2 (SGLT2) inhibitors: A review of their basic and clinical pharmacology. Diabetes Ther 2014;5:355-66. Leng W, Ouyang X, Lei X, Wu M, Chen L, Wu Q, et al. The SGLT-2 inhibitor dapagliflozin has a therapeutic effect on atherosclerosis in diabetic apoE-/- mice. Mediators Inflamm 2016;2016:6305735. Singh AB, Kan CF, Shende V, Dong B, Liu J. A novel posttranscriptional mechanism for dietary cholesterol-mediated suppression of liver LDL receptor expression. J Lipid Res 2014;55:1397-407. Min SH, Oh TJ, Baek SI, Lee DH, Kim KM, Moon JH, et al. Degree of ketonaemia and its association with insulin resistance after dapagliflozin treatment in Type 2 diabetes. Diabetes Metab 2018;44:73-6. Matthaei S, Bowering K, Rohwedder K, Sugg J, Parikh S, Johnsson E, et al. Durability and tolerability of dapagliflozin over 52 weeks as add-on to metformin and sulphonylurea in Type 2 diabetes. Diabetes Obes Metab 2015;17:1075-84. Sato T, Aizawa Y, Yuasa S, Kishi S, Fuse K, Fujita S, et al. The effect of dapagliflozin treatment on epicardial adipose tissue volume. Cardiovasc Diabetol 2018;17:6. Gaspari T, Spizzo I, Liu H, Hu Y, Simpson RW, Widdop RE, et al. Dapagliflozin attenuates human vascular endothelial cell activation and induces vasorelaxation: A potential mechanism for inhibition of atherogenesis. Diab Vasc Dis Res 2018;15:64-73. Abdel-Wahab AF, Bamagous GA, Al-Harizy RM, ElSawy NA, Shahzad N, Ibrahim IA, et al. Renal protective effect of SGLT2 inhibitor dapagliflozin alone and in combination with irbesartan in a rat model of diabetic nephropathy. Biomed Pharmacother 2018;103:59-66.